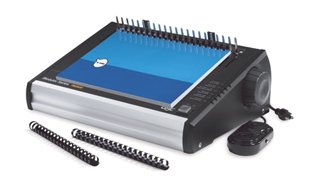 The GBC PB2600 electric comb closer is very easy to operate with either the dual foot pedal or table-top button to activate the binding process. User-friendly features, adjustable binding knob and LED display, help to easily set-up the system for each binding job. Set spine size and get it done in three quick steps. Simply push the button or foot pedal to open, load pages and push again to close. Interested in the GBC PB2600? Contact us to see how this Bind Closer can help your business!